The iPad 2 “feels” like a much smaller tablet. It’s lighter and thinner. 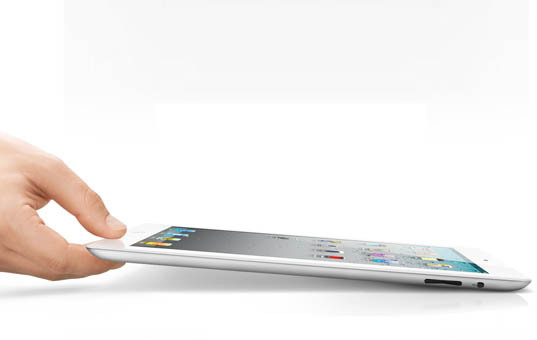 The thing that surprised me the most about the iPad 2 was the weight. It’s much more comfortable to hold. If you lay it on a table it doesn’t wobble like the original iPad. Just swiping screens around you won’t notice much of a speed bump. No big deal. I decided to give Artrage a try. I did a memory wipe restart on both iPads so they started with a clean slate. I sat with both iPads on my lap and launched Artrage in unison. Artrage started some seconds faster on the iPad 2. I should have timed it, but it was more than noticeable. On new canvases, I selected the largest watercolor brush with the wet on wet setting. I applied a large red triangle with a fast stroke on both iPads. The iPad 2 finished the three triangle sides before the original iPad finished the first side. The iPad 2 is quite a bit faster, but not fast enough to remove the lag of the watercolor brush. I changed colors (blue) and brushed again making sure to do some round circles to mix the colors. The original iPad had barely started the stroke by the time the iPad 2 finished. Not impressive, but almost. Next, I opened up the Artree app. The purpose of this app is to auto generate trees. I never thought anything about the speed or growth of the tree. The original iPad seemed fine, growing the tree in a relaxing way. Artree on the iPad 2 grew much much faster, it was a little shocking. Last, I tested the Brushes app. On new canvases, I just made some fast strokes. Brushes is already really fast and neither iPad lagged. Not a very good test. I exited the painting to the gallery and highlighted a painting I did a few weeks ago. The painting has a good number of strokes. I timed the playback on the original iPad. The movie of the painting played back in 3 minutes, 4 seconds. That same painting on iPad 2? 2 minutes and 2 seconds. Damn fast in comparison. Those were just a few quick tests. It depends on a couple of things. If you feel like the apps you use are slow, then you could certainly benefit with an upgrade. 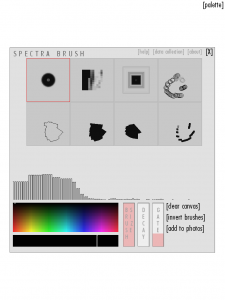 For instance, I love Artrage, but some of the tools are really slow. For me that was a deal breaker. Artrage on the iPad 2, while not lag free, seems much more up to the challenge. But it’s not as good as my iMac. If you think that painting on the iPad has been revolutionary and you are happy with how it’s going, I wouldn’t recommend the upgrade. If you have the spare cash, I think it’s worth the upgrade. I obviously made it myself and doubt I will regret it. I’m painting more than I ever did before and now it will be faster. 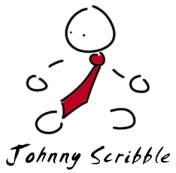 The iPad 2 is a step in the evolution of the tablet genre, but it’s not in my opinion a new product. 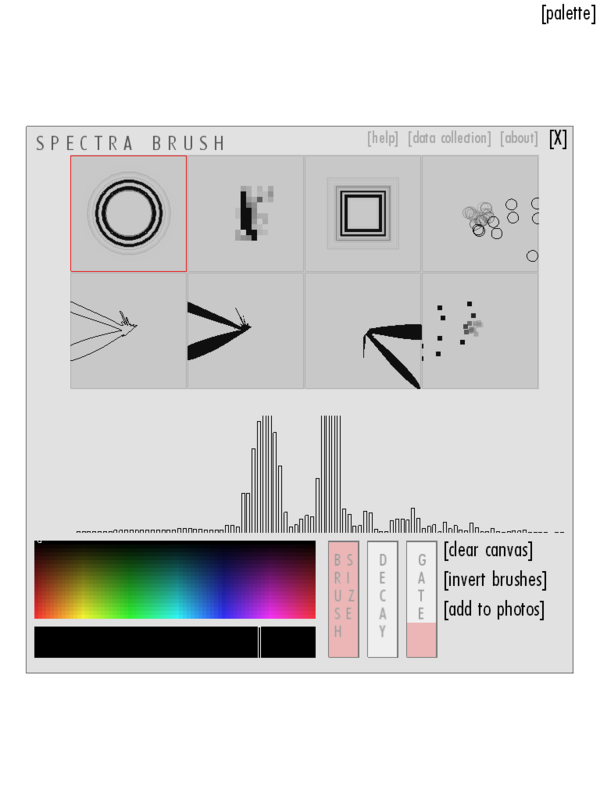 SpectraBrush (itunes) was made as part of the “Sound, Image and the Brain: Cognitive Live-Arts Technology in Contemporary Game-Oriented and Accessibility Paradigms” project at Goldsmith’s. 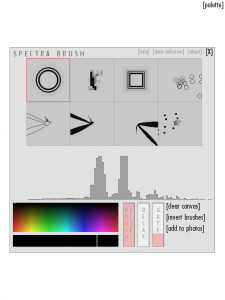 It’s a fun experimental app, you can grab it for free in the app-store.